Hi everyone!! I will review this new Denver Imperial Deodorant for men. The deodorant is in white can and has a decent packaging. The best thing is that this smells really nice. My husband is liking it a lot. He is saying that I will be purchasing this again. Price: 210 rupees for 165 ml pack. About: Denver, the leading brand in Personal Care products for Men has commenced Imperial Deodorant under Hamilton range of deodorant for elegant persona of the man who aspires for rich and elegant fragrance. 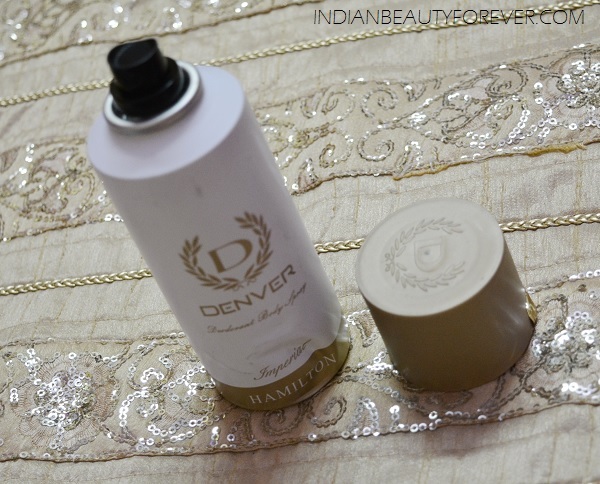 Denver Imperial Deodorant has opening notes of fresh, spiced with cinnamon. The heart is woody which possesses an intensive floral-spicy aromatic scent and lingers with a massive leather note. Denver Imperial is dedicated to the men who appreciate tradition and are fans of classic. The burst of masculine scent with an excellent play of musk and exotic spices compliments a winning attitude of a man. Denver Imperial is one of the few contemporary fragrances in which the well-known intensive leather note can easily be recognized. The deodorant looks good when it comes to packaging moreover; it has a very exotic musky smell which is really nice. He applies it in the morning after the shower and it lasts for around 8-10 hours. When he comes home then too the deodorant is detectable in pretty intense whiff. It’s not that it fades away or gets vanished completely. There is no irritation of burning when used on the underarms. This is a good everyday deodorant that is ideal for men who likes musky fragrances.